The smell of banana bread baking has to one of the greatest pleasures. I make this loaf quite often as I tend to buy lots of bananas, but don't really get around to eating them. 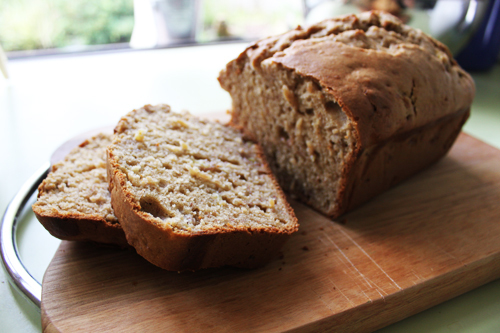 I even have a couple of bananas in my freezer waiting for the next time I make this loaf! The great thing about this recipe is it is soft and moist, and can last days without drying out. It's also an ideal banana bread to freeze or toast. The original recipe came from the Australian Women’s Weekly, but I have altered it slightly, as some of the methods seemed unnecessary. The original called for 1 3/4 cups plain flour and a 1/4 cup of plain flour. It also said to mix the wet ingredients separately, and then add to the dry. I just prefer to add all the ingredients in the one bowl! The recipe also called for 2 bananas but it works much better with 3. Preheat oven to 180°C. Line a loaf tin with non-stick baking paper. In a large bowl, mix the flour, cinnamon and sugar, breaking up any lumps of the brown sugar. Add the eggs, milk, butter and bananas and mix until well combined. Pour the mixture into the tin and bake for 45 – 50 minutes, or until a skewer inserted into the centre comes out clean. Remove from the oven and set aside in the pan for 5 minutes. Turn onto a wire rack to cool completely. This banana bread is simple, and adding nuts to the recipe would just be the key for me! But I think its a great idea to use the third banana over just two like the original recipe. It looks delicious!